Ministry of Electronics and Information Technology (MEITY) is going to start Stree Swabhiman Initiative. Subsequently, this is an unique initiative by CSC to ensure good health and hygiene for women. 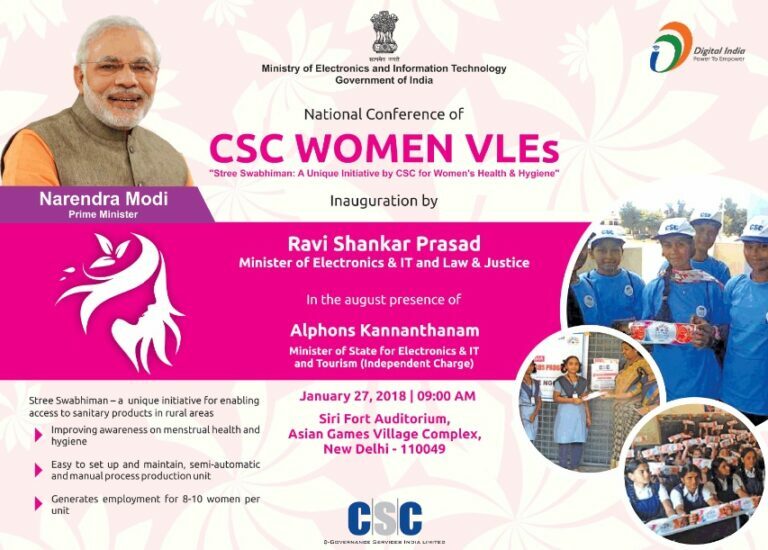 Accordingly, Central government will launch this at event of National Conference for Women VLEs. Under this scheme, govt. will provide eco-friendly menstrual pads to the women. This initiative will provide access to sanitary napkins to the girls and women in rural areas. Accordingly, this move of central govt. will improve awareness on menstrual health and hygiene. Moreover, setting up and maintenance of semi-automatic and manual process production unit is easy and hassle free. In addition to this, each production unit will generate employment for 8-10 women. Currently, around 15 low-cost sanitary napkins manufacturing units are present across the entire country. So, Central govt. wants that more people should get involved for this cause. Common Service Centers (CSC) are going to implement this initiative at the root level across the country. CSC are committed for providing affordable, reliable and modern menstrual pads (eco-friendly) to women and girls in rural areas. This is unique initiative by CSC to protect Stree Swabhiman. Accordingly, these pads are safe to use and cheap in price. Furthermore, these pads will ensure safety and hygiene of women. Moreover, women in rural areas will get aware of the benefits of using sanitary napkins and pads.